Lithuanian parties this year do not ignore the electorate of national minorities in Vilnius, as evidenced by Polish candidates also outside EAPL-CFA. 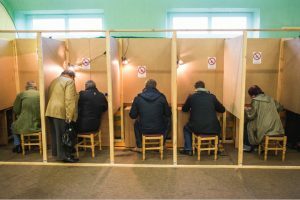 In this year’s local government elections, 23 entities registered in Vilnius: 15 parties, 6 election committees and two coalitions. As an alternative to EAPL, a Polish-Lithuanian electoral committee “Lokys” was established in the Lithuanian capital. The only one on the list of “Vilnius Bear” is a descendant of Adam Mickiewicz, a businessman and a citizen of France, Roman Gorecki-Mickiewicz, who has lived in Lithuania for years. The Mayor candidate, Rajmund Klonowski, starts with the third number. The Lithuanian Social Democratic Party, which recently devotes a great deal of attention to the problems of national minorities, has made the highest place on its list available to a representative of national minorities among all parties in Vilnius. Well-known Vilnius blogger, lawyer and social activist Alexander Radchenko will start fourth. On the list of the electoral committee “Team of Remigijus Šimašius: For a Vilnius, we are proud of!” („R. Šimašiaus komanda „Už Vilnių, kuriuo didžiuojamės!“) there are also several Poles. The 17th place went to the EFHR lawyer Evelina Dobrovolska, and the 58th member of the Polish Discussion Club Zbigniew Samko. Raimondas Pomarnacki, who declares Polish nationality, starts from the list of 54 conservatives. Among the candidates of the Artur Zuokas Coalition “Happy Vilnius” (A. Zuoko ir vilniečių koalicija “Laimingas Vilnius”), the head of the Artistic Agency “Polish Events in Lithuania” and a member of the Polish Discussion Club, Paweł Żemojcin. The list of the Lithuanian Social Democratic Labour Party includes two Poles: Aleksander Kunicki (15) and Viktoras Gulbinskis (33).